compares scarring resulting from FUE method vs. strip harvesting. Given 10,030 potential grafts in the average patient, I assume theoretically, this article states “In our ongoing study to assess the width of donor scar we have found that the it is possible to decrease the width of our incisions to 0.57 mm. A 20% wound contraction would result in a total surface area of 0.16 square millimeters per incision. This effectively reduces the total potential scar to 16.3 square centimeters and reduces the scar to total available donor surface area to 0.075 (the equivalent ratio of linear scar to excised donor area from strip harvesting in the best case scenario).” So for a FUE of 3000 grafts that means scarring of 5.4 square centimeters. What does this really mean? Articles that I have read mention no visible scarring. Under what conditions? FUE patient with re-grown hair in donor area? 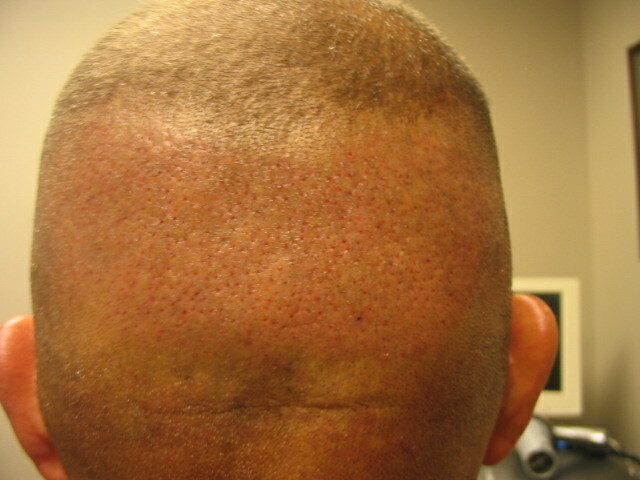 Is this relatively small scarring visible on FUE patient, if hypothetically he shaved his head after healing completed? ARE THERE ANY PICTURES OF FUE PATIENTS WITH SHAVED HEAD (Don’t ask me for what reason WHICH WERE TAKEN SOME TIME AFTER SURGERY? There are many pictures on this site that shows days after. Understand that no FUE is completely scarless. Also know that the perception of the scar has been seen to be quite unnoticeable when using smaller punches. The standard for many clinics is 0.75mm -1.0mm. However most use the 0.75mm which can successfully pull out grafts in 1’s,2’s,3’s,4’s and even 5’s. Here is a comparison. » WHICH WERE TAKEN SOME TIME AFTER SURGERY? Here’s some links to pictures of the donor area after FIT. Hopefully it will help to clear things up for you. If you have any questions, let me know. http://www.hairsite.com/hair-loss/forum_entry.php?id=7327&page=0&category=2&order=last_answer Don’t forget this one! Here is a link to a clinic that took the time to shave this patient all the way down. I think it is razor close. However this typ of result is seen using the 0.75mm punch. I don’t represent GHI but I certainly appreciate their work. Ok here is the next day photos of the donor area. And then a comparative look. at 1.5 hrs/4hrs/and 20hrs post op. I cannot tell you enough how great this looks to me. I am not used to this type of donor area at post op. Again the 0.75mm punch. » op. Again the 0.75mm punch. where did you get that average number of grafts from? » where did you get that average number of grafts from? Please do further research into this and not taken from one site only. I beg you. That’s what I intend to do since none of these photos make it easy for me to determine how relevant is FUE scarring when compared with strip method. I have seen scar from strip method and it wasn’t visible even with very short hair. There are a lot of articles quick to point out less scarring as an advantage of FUE method over strip. 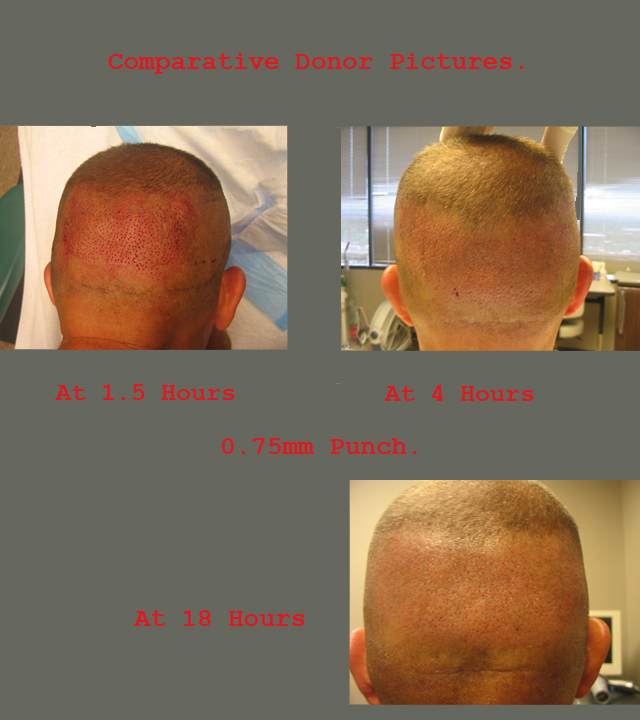 Assuming hair loss won’t reach the donor site for the strip method, FUE looses it’s advantage quickly. Under same assumption, let’s say I had hair transplant and after several years my hair loss slowly progressed. If I had strip method done I can get another hair transplant. If I had FUE done I could get another hair transplant or could I shave my head razor-thin without anyone noticing FUE? This is the reason behind my question. I’d like to know if it is an option after FUE once hair loss slowly progresses!? » the donor site for the strip method, FUE looses it’s advantage quickly. Good point. One thing to consider. If you are considering FUE. At least go to the doctors that start out with the very smallest tools. If you start out small then you start out with the least potential scarring…IMO. This HAS been proven over and over. Strip scars while they are a 1000% better in terms of the closures. They CANNOT be predictable in scar turn out. They just can’t. Everyone is different when they scar. Hairtech is correct, while strip scars are far better then in years past, your propensity to scarring is unknown. This can be controlled to some extent by choosing an office that repeatedly produces minimal scarring from the donor harvest. There are so many factors to consider when performing a strip harvest,i.e. amount of grafts, total area of donor strip (length vs. width), scalp laxity, healing characteristics, donor closure method, and so on. Each of these considerations need to be discussed with every office you are considering for your procedure. Here is a photo collage of one of our patients. We performed 2 procedures for a total of 4039 FUE grafts. All of his grafts were harvested with a .75mm punch. We consistantly see this kind of healing with the .75mm. Notice the shaved photos. We wet shaved his donor approximately 4 months after his second case to expose the scalp to show just how well the .75mm heals. All other punch tools, .8mm-1.5mm will leave different levels of noticeable scarring in the donor. Obviously, the larger the punch tool the larger the resulting scar. I was trying to send him to that exact razored pictures of yours. Thanks GHI. That’s what I am talking about. Here is a picture of a patient we took 2000 grafts from. Picture was taken 12 months after the first session. Please discard the red spots, these are psoriasis areas. What size punch did you use? I know what size it is. We need this statement to continue the confirmation and verification of what produces the least scarring in advanced FUE today. Proudly state your standard punch size sir. Here is a collage of photos of healing in the donor with a .75mm punch. » the least scarring in advanced FUE today. » Proudly state your standard punch size sir. Hehe, I proudly state that we used 0,7 mm instruments for the extractions. » We realize these photos may be too “small” for some to notice the donor. Thank you for these photos. Can you post or email me larger photo of the patient at the bottom who is known as Steve K on your web site? I’m very interested in looking at a larger photo of “6 Weeks After Clean Shaven” (http://www.globalhairinstitute.com/article.asp?ID=61) and 1 year after. » scar has been seen to be quite unnoticeable when using smaller punches. » 5’s. Here is a comparison. » vasculature, possibly minimizing the risk to the follicles left behind. That was my question for you guys. I was wondering about the scaring of FUE. I am trying to gather as much info as i can!!! I will be posting some pics of my HT that I think and know went wrong. I did not want to go for another FUSS.